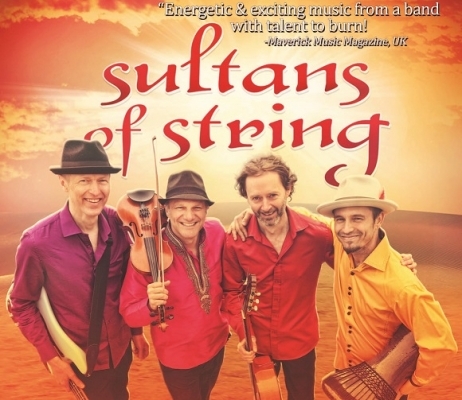 3x JUNO nominees and Billboard charting Sultans of String are an “energetic and exciting band with talent to burn!” (Maverick Magazine UK). Thrilling audiences with their genre-hopping passport of Celtic reels, Gypsy-jazz, Arabic and Cuban rhythms, fiery violin dances with kinetic guitar, while bass and percussion lay down unstoppable grooves. Throughout, acoustic strings meet electronic wizardry to create layers and depth of sound. Celebrating a milestone 10 years together, Sultans of String have hit #1 across Canada on Top 10 national radio charts, the New York Times Christmas Hits list, and received multiple awards and accolades, including 1st place in the ISC (out of 15,000 entries), 3 Canadian Folk Music Awards, plus invitations to perform/record with such luminaries as The Chieftains, Sweet Honey in the Rock, Richard Bona (Paul Simon), and David Bromberg. This event has been viewed 720 times.